Movie Review - 'Frankenweenie' - 'Frankenweenie': A Remake Needing Of A Jolt Of Life Tim Burton's feature-length retake on his 1984 short film reflects the director's signature style — but, says critic Stephanie Zacharek, the material may be better suited to a shorter form. Every filmmaker has the right, of course, to remake his own film. And what filmmaker wouldn't relish the chance to redo something he felt he didn't get quite right the first time around, either for lack of funds or for lack of support from a studio? Tim Burton probably had every reason to want to refashion his 1984 live-action short Frankenweenie — about a boy who resuscitates his recently deceased dog using methods straight out of James Whale's Frankenstein — into an extravagant, full-length stop-motion feature. He'd made the original Frankenweenie, a compact, funny and deeply touching bit of filmmaking, when he was a young animator at Disney. But because audiences responded to it negatively at early screenings — some parents deemed it too dark for the kiddies — the picture was shelved, and Burton and Disney parted ways. Now Burton is back with a bigger but not necessarily better Frankenweenie — again made for Disney — and the picture is frustrating not because it's bad, but because of how almost-good it is. The movie's first half, in particular, is surprisingly effective and affecting, and for the most part it preserves the joyful-melancholy spirit of the earlier film. That picture rendered suburbia, in beautiful, radioactively glowing black and white, as a place where anything could happen, a place where fair-minded authority figures like Daniel Stern and Shelley Duvall might be your parents, a place where love — plus electricity — is so strong, it can even supersede death. But the second half of the new Frankenweenie floats out of Burton's control; it's noisy and boisterous and, well, big — an overgrown parade balloon, and an affront to the gentle intimacy of Burton's original idea. Young Victor Frankenstein (voiced here by Charlie Tahan) is a skinny suburban loner who enjoys tinkering with scientific equipment and playing with his dog, Sparky, who's also his only friend. Victor's parents (Catherine O'Hara and Martin Short) worry about him: Mr. Frankenstein, in particular, wishes that he'd do more normal kid stuff, like play sports. Edgar (Atticus Shaffer), the film's Igor character, accidentally causes problems for Victor and his pooch. Victor makes a halfhearted attempt at baseball, which leads to the accidental demise of Sparky. (The moment is handled discreetly, off-camera, though it has the proper amount of emotional weight.) The already-haggard lad becomes despondent, until he's inspired by the new science teacher at his school — a beanpole Vincent Price lookalike with the delightfully unpronounceable name Mr. Rzykruski, voiced by Martin Landau — to raise Sparky from the dead via the wonders of electricity. Victor sets up an elaborate laboratory in his attic and, with the help of a lightning storm and a few ordinary household objects (including a toaster and light-up Christmas reindeer), jolts new life into Sparky. Although the Sparky from the original Frankenweenie, a bull terrier with two Karloffian bolts sticking out of his neck, still wins the top prize for ugly-cuteness, this stop-motion Sparky, with his expressive eyes and snuffly nose, is plenty adorable. But Burton doesn't give us enough of him. He drops out of sight for long stretches, and when he's absent, the plot gets excessively complicated and includes too many unappealing or uninteresting characters, including a grouchy, megalomaniacal neighbor, Mr. Burgemeister (also voiced by Short) and his wan Goth niece (Winona Ryder). That's not to say the second half of Frankenweenie doesn't boast touches of great cleverness, among them a throng of maniacal overgrown Sea-Monkeys who look all too much like the ones pictured in the back of the comic books — which is to say they look nothing like real-life Sea-Monkeys, those disappointing little curlicues drifting dispiritingly in a glass of water. 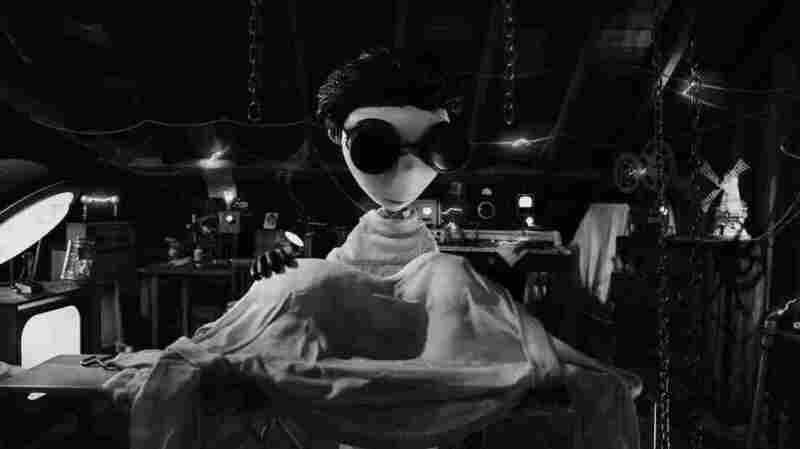 And Burton shows a great deal of integrity by making the new Frankenweenie black and white, as the original was. That will surely be a novelty to plenty of kids, but it also gives the picture a classical, elegant look. Still, integrity can take you only so far. 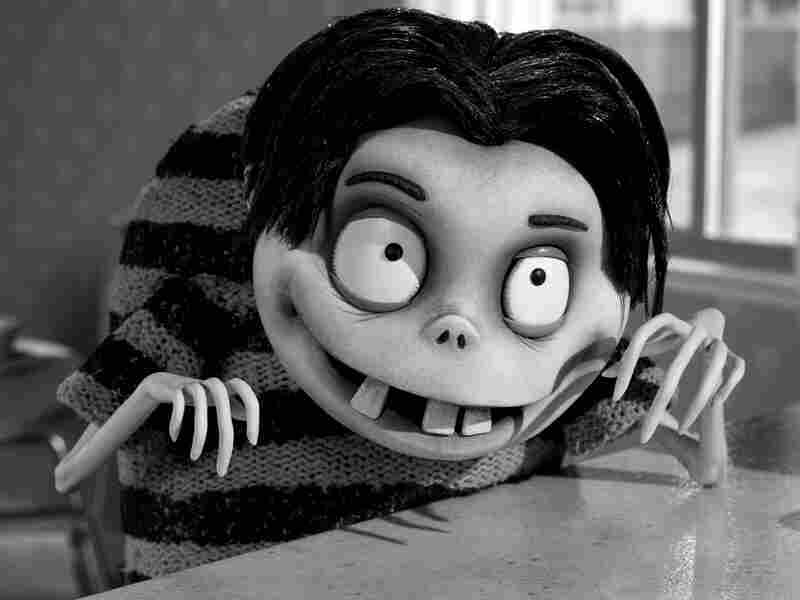 And in terms of its design, Frankenweenie stumbles in a few crucial ways, notably in the character design of young Victor: He looks too much like a post-plastic-surgery Michael Jackson — his nose has been snipped away to a tiny, unappealing nub. That makes him a little hard to look at, and even harder to care about. Burton half succeeds in making this revamped Frankenweenie its own distinctive creature, pieced together from the essential bits of the 29-minute original. But he just doesn't know when to stop, and his overgrown creation gets the better of him. Sometimes, small really is beautiful.